Ever since I am student of the academy, I am dreaming of nothing else. I would like to stand in the big rock arena and test my skills with equally capable adversaries. But its a long way to get to the battlefield, watched by a lot of fans. Not everyone can fullfill this dream, because soil of the arena will host only the best fighters. But I still have no doubt, that my chance will come. Box containing Mage Wars Academy is considerably smaller, than its big brother Mage Wars. That does not alter the fact, that even in this new game, author still remains standing and is named Bryan Pope. Creation has also seen participation of Brosman Aaron and Matthew Burch. Due to the absence of a giant board, game looks more accessible to players. It was published and distributed by Arcane Wonders. 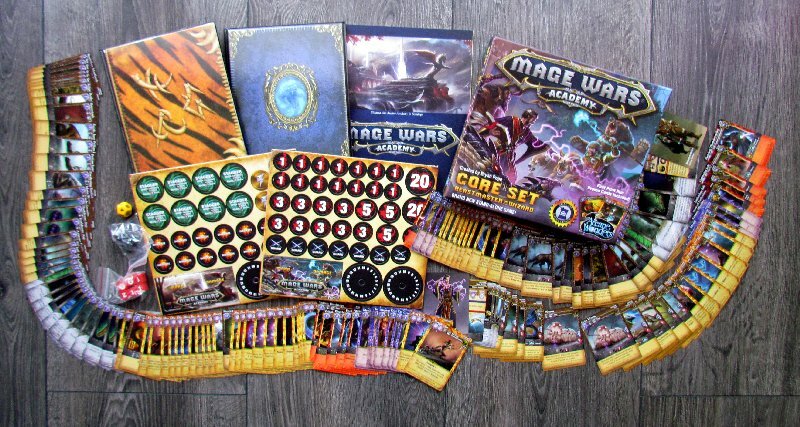 What makes the Mage Wars famous is present even in its smaller edition – it’s books of spells, full of pockets, which can players fill with magic of their choice and balance their skills. That’s just the first moment, when players decide their own destiny. 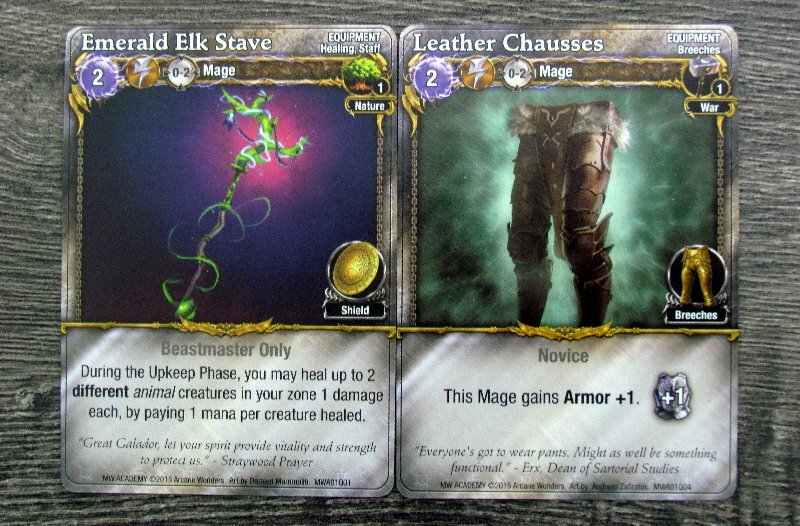 But first, both choose their hero, who has clearly stated his preferred class of magic. 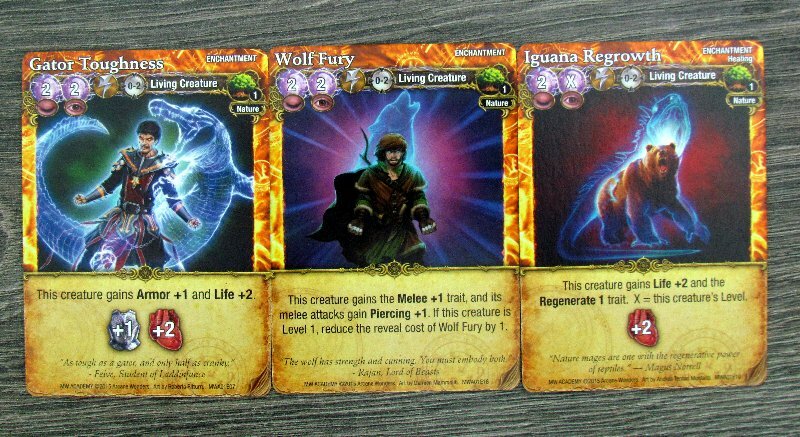 In this framework, you can then choose from all available cards of monsters or other effects, that can be added to your book. By doing this, you have to keep within the overall point limit. Now that number is one of the qualities, that players can read on all cards used by their magicians and if it does not meet his class, then its cost is doubles. 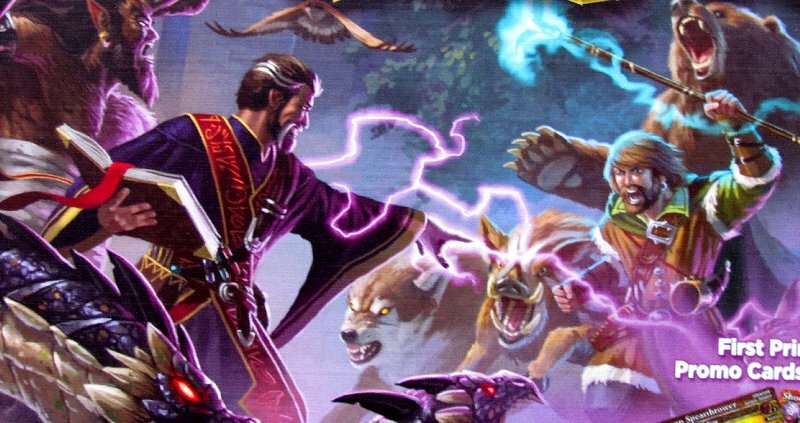 That is, why both opponents must choose a role – either beastmaster or wizard. But we can certainly expect other classes and new spells through future expansions. But now back to the game. 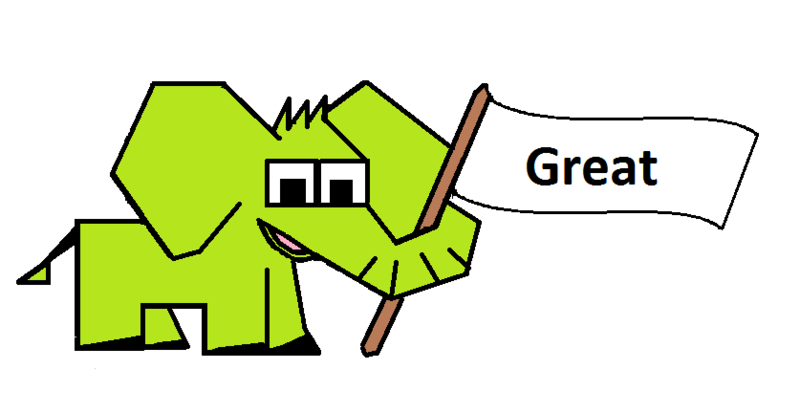 For its beginning, each participant needs his own cardboard pointer of mana and injuries. Players also gets warrior card together with second card of capabilities, which shows skills usable in combat including description, as well as number of lives or value of magical energy. They set their indicators correctly based on their readings. Players then place a pile of dice and state tokens. 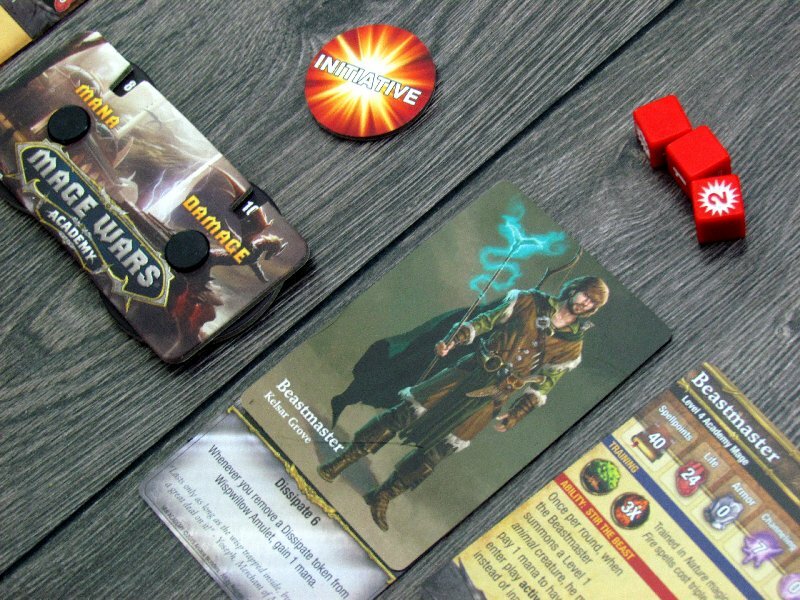 Game then lets player alternate in activating their units. Each has always a chance to perform one action. This is not necessarily an attack, but choice is also from casting a spell (except mages, even some monsters can do magic) or taking a defensive stance (such creatures must be attacked first in player’s army). 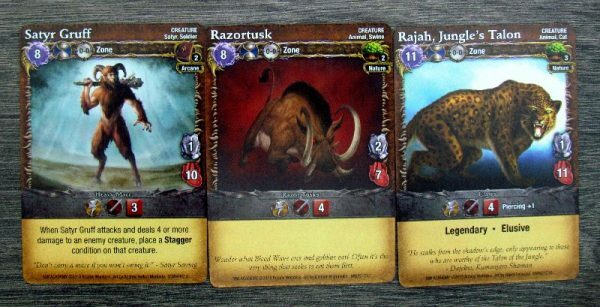 Players go back and forth, with chance to choose one of their creatures and take advantage of its capabilities. 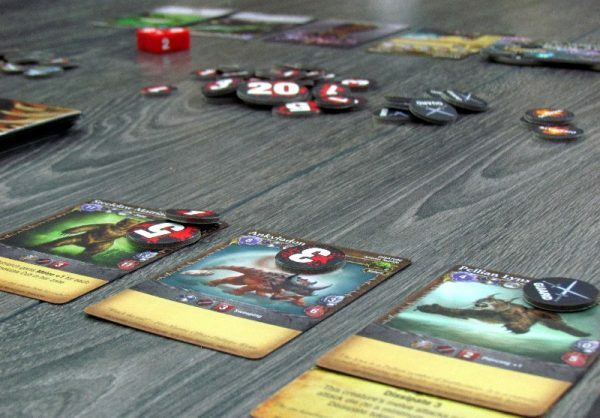 Players place summoned cards in front of them in line. Positional battle is not present here, which means ability to use any cards anytime to attack opponents on the other side of the battlefield. As the target of their attack, player can choose any hostile creature, but only when there is no guard. Defender may try to avoid the fight with his spells. Only then, if the battle is still on, it is followed by a roll of the dice – their number is based on strength of applied skills. If the results shows an asterisk, such hit is critical and cannot be averted. 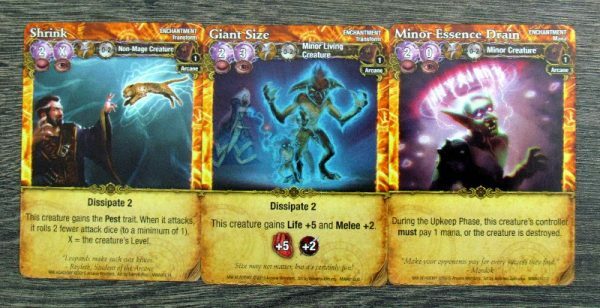 Number of all other hits is lowered by armor of attacked creature and only resulting value will be marked as injuries using numeric tokens on that specific monster. If at any time the amount of injuries exceededs number of lives, then creation is immediately withdrawn from the fight. In addition, some attacks also bring additional effects depending on special roll of the dice. Some of the characters from cards, including mage, can choose summoning as their action. At this point, player selects any card from his spellbook, pays required value of magical energy and either adds card to his line of monsters or makes another use of that spell (attaching equipment or doing some instant magic). In addition to the classic actions, sorcerer can also make (once per round) a single quick cast. Only some spells meet this category, so its not possible to do anything they think of. After activating it, player in the role of mage turns used card to the side to make it clear, that it already used this round. 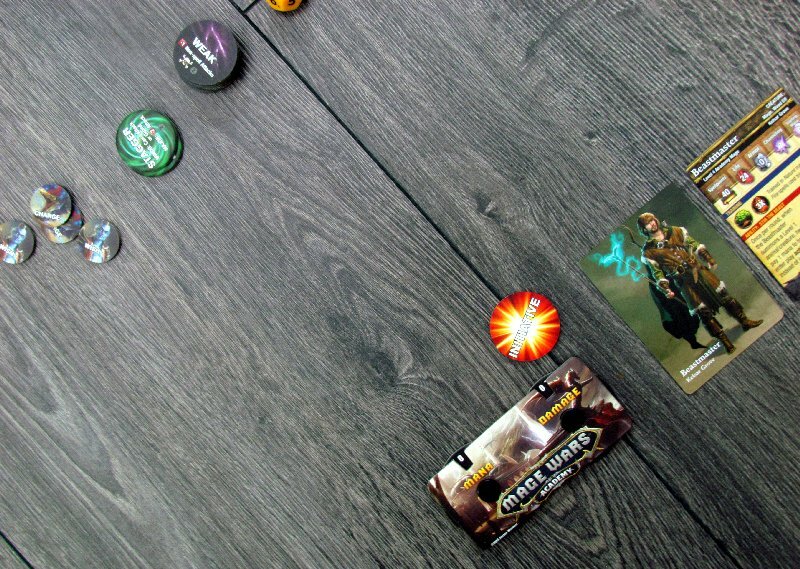 At the beginning of each round, individual wizards gain magical energy, depending on their channeling ability, but also restore token indicating of quick spell. They also have to manage active effects (usually bad, like bleed) of their characters. Aim of both opponents is obviously to hurt the enemy mage. Player, whose hero manages to hold longer on his feet is winner of the battle. 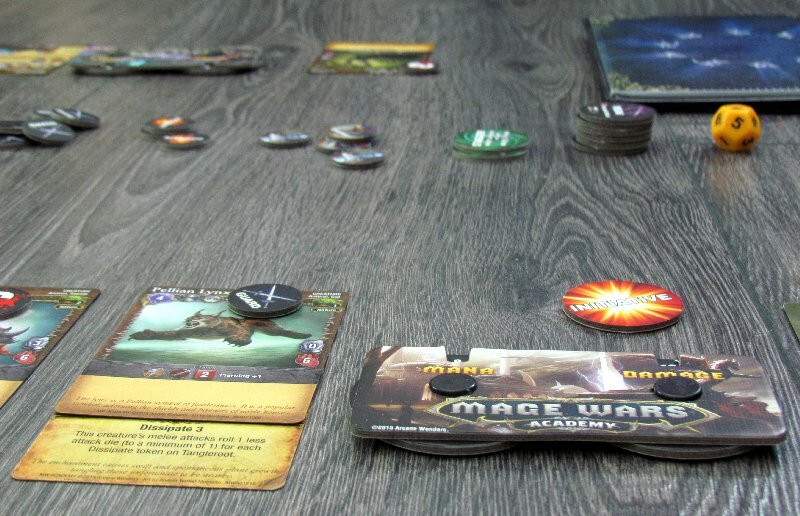 Mage Wars: Academy is a cool simplification of excellent bigger game. But reduce occurs only in moving units around the map. That activity is missing and everything is replaced with two static armies, that can challenge each other, as they wish. In conclusion, all qualities of Academy are narrowed down to one question. How important is positional play? 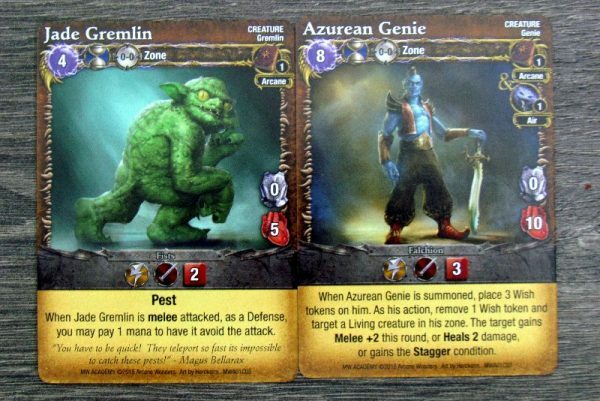 This omission is of course at the expense of larger tactical focus, but great news is, that even being like this, Mage Wars lose nothing of their charm. 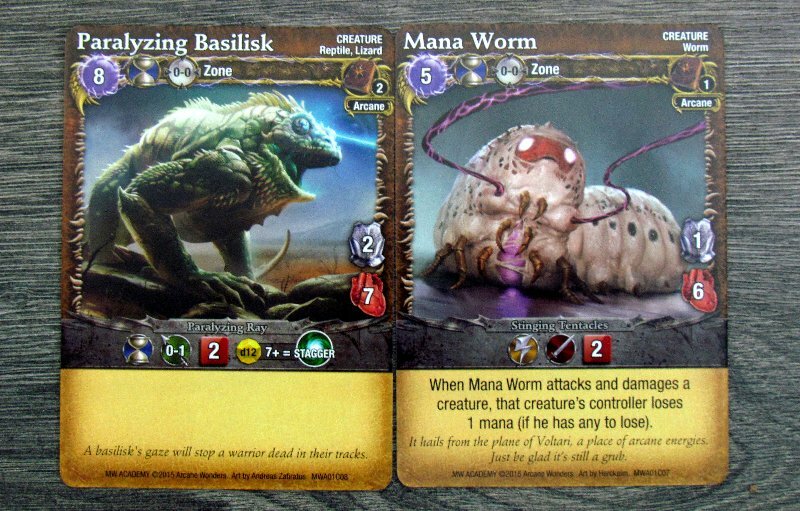 The game is faster, more accessible, but still very much focused on piling equipment, spells and monsters. These are drive mechanisms even in this new smaller box. Virtually every player wants to (and can) have any creature under his control. 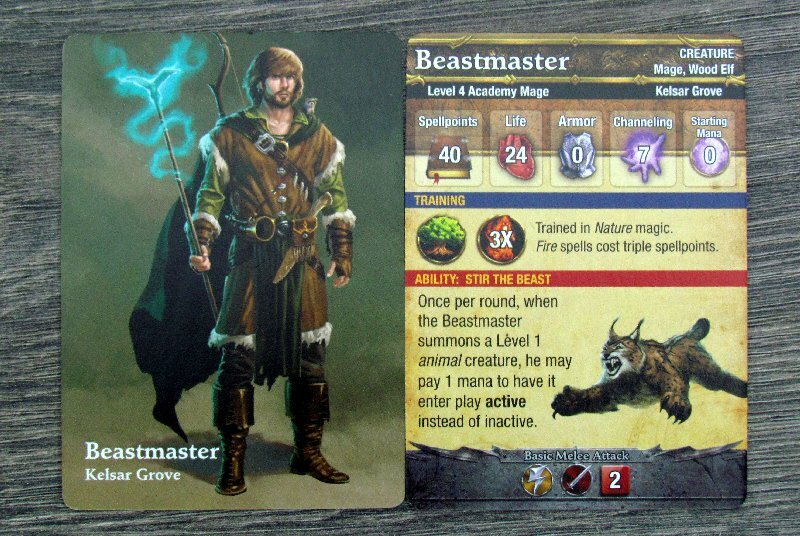 Especially for the beastmaster class, which is represented in base set. And yet, it is possible to specialize the other way around, make your wizard unstoppable and cut through enemy ranks with your own hands, without any help. 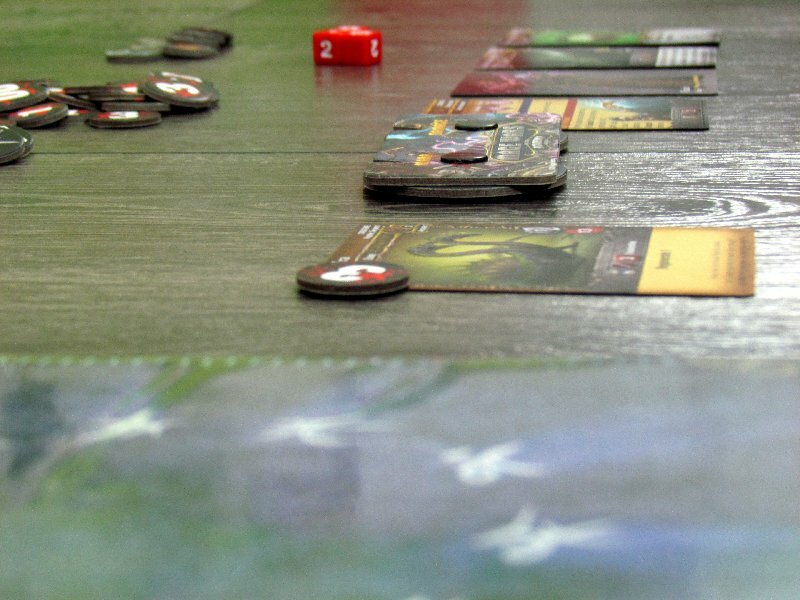 Game remains rich in keywords and various dynamic effects. Players will not achieve even a hint of success without attacking the enemy. There is not much room for waiting. 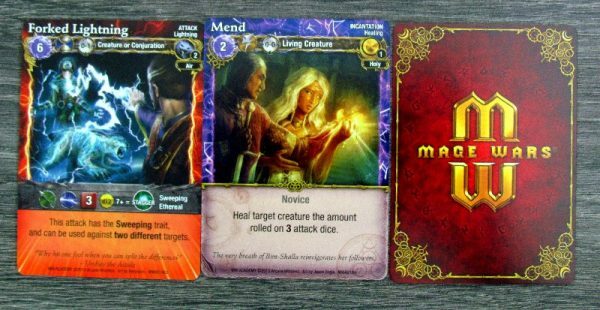 From start to finish, rivals are sitting against each other, sending waves of attacks, trying to break through a defensive wall and destroy enemy wizard. Battles are a bit random, which is good. Matches are always interesting and highly dependent on preparation of book of spells. 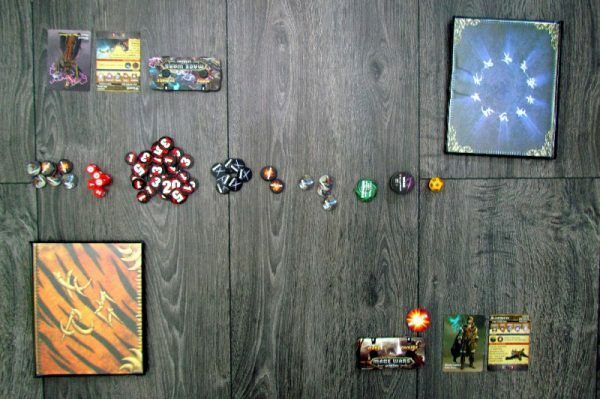 That is reason, why rules give you a starting setup of cards, which you can use to build your first spellbook and touch underlying mechanisms before you start creating your own. Box size in this case also matters. Generally, board games often do not stay at home, when you leave, but you want to take them with you to various events or meetings. And where original Arena has large box, its better to take small Academy with you and get almost the same experience. Thanks to its dimensions, this new game is easily taken on the road, but still needs some space to play. Cards in the new Academy are also prepared to be used in Mage Wars Arena, because individual numbers also include range, which you will otherwise not use in this smaller card version. 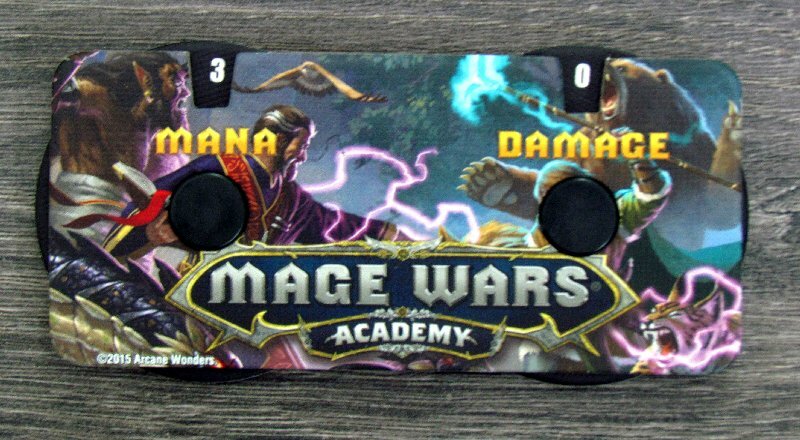 Game can be joined by other players, if you have more boxes of Mage Wars Academy. 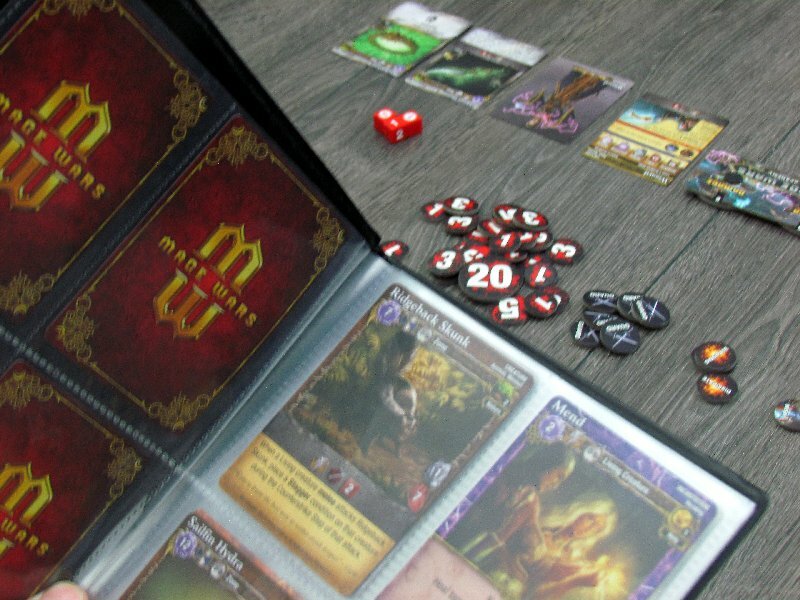 Unfortunately, we had only one, so we can not verify quality of multiplayer, but out of earshot, we learned, that the mage duel in multiplayer is also excellent. Game time, however, is what distinguishes this new game from its bigger brother. Why? Because matches will fit seamlessly into half-hour experience and often last even less. Mage Wars: Academy is great fun. It’s an excellent card game, that definitely ranks among absolute top duel games. It is partly for its speed, but mainly due to atmosphere and depth of options. 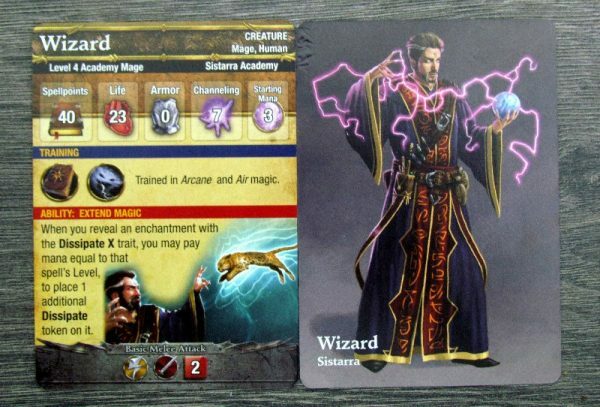 There is plenty of cards, split to magic schools and players themselves can create their own spellbook. How cool is that? Mage Wars: Academy deservedly belongs to the collection of any lover of magic and duel gaming. 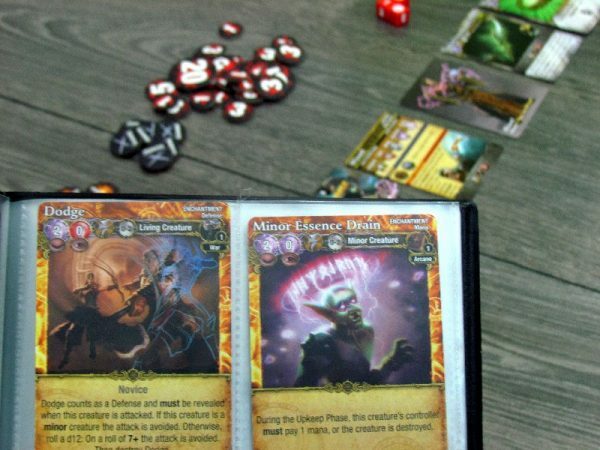 Mage Wars: Academy again offers players the opportunity to experience feeling of becoming true magicians. 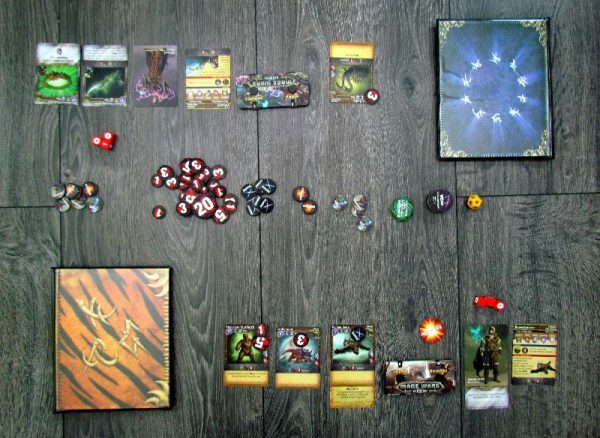 This is a sophisticated game, that offers plenty of spells, effects, and above all creatures, which players can summon into their ranks and let them fight for their cause. Game is very conflicted, surprisingly fast and balanced. Mage Wars: Academy is game, that dominates with atmosphere and offers awesome experience.